As soon as you cross into Nevada, you can sense it in the air: luck. Good luck, bad luck, and everything in between. Mountain bike racing presents opportunities for gambling, so Carson City seems as good a spot as any for the third round of the Epic Rides Series. I was just hoping things would break my way after misadventures in the Whiskey Off-Road and Grand Junction Off-Road. I should backtrack for a moment and clarify something about Carson City. Yes, there are casinos (one adjoining my hotel, in fact). 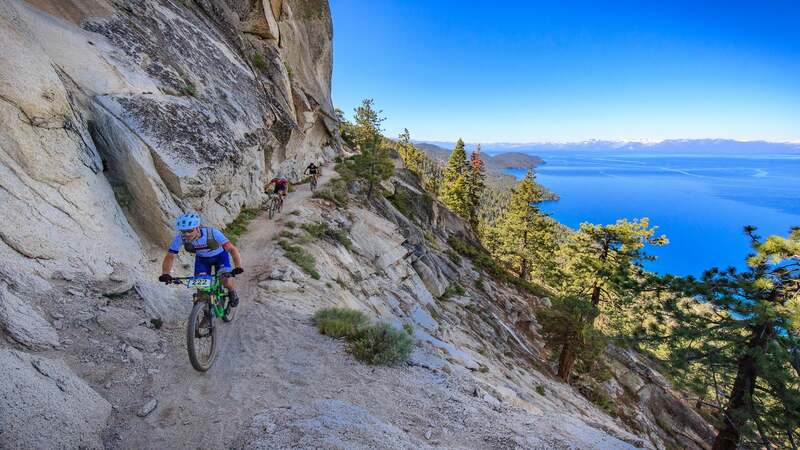 However, at the foot of the mountains that ring Lake Tahoe, the town has potential to become a mountain bike destination. The race’s huge 52-mile loop would take us up to the famous Tahoe Rim Trail and back on a mix of singletrack and Forest Service roads. And if local trails organization Muscle Powered keeps up its work, more and more of that route will become trails in the years to come. I started the weekend with mixed fortunes. The volunteer at registration told me my number plate, 222, was lucky. And then I crashed while pre-riding the day before. Call that a wash.
On Saturday, we rolled out with clear skies, cool temperatures, and a light breeze. The field was pretty stacked with a lot of fast Californians, including a certain Levi Leipheimer. To be honest, I was a bit intimidated. There were a lot of hardtails and aero helmets on the start line. As usual, I was aboard my “cross-funtry” set-up, a Fezzari Signal Peak with a Smith Session protecting my melon. As I suspected, on the first steep climb before we even got to the singletrack, things got pretty spirited. With about 6,200 feet of climbing ahead, I didn’t take the bait. Instead, I settled into my pace as we climbed the 18 switchbacks up Ash to Kings trail. Sometimes these races are like getting into a hot tub. When you first touch the water, it seems unbearable. You ease in. And then you get used to the temperature or even (hopefully) forget it is there. Once we descended the backside of that first major climb, over a hillside denuded by a forest fire, I began to realize I could take the heat. I kept my shocks in climb mode all the way up to the Marlette Flume Trail, hardly noticing the 120mm of travel as I pedaled up to two guys who had made an early move. We turned onto that famous piece of singletrack and were immediately surrounded by the panorama of Lake Tahoe and the surrounding mountains. Maybe this is what it feels like to fly inside one of those plexiglass turrets on a World War II bomber. The views were as distracting as walking through a casino but far more enjoyable. That said, the penalty for distraction could be a tumble down hundreds of vertical feet on that steep mountainside, so the glimpses of Tahoe were fleeting. The trail even has a mandatory dismount at a particularly sketchy moment. Ridable? Sure. Worth riding? Probably not. I unclipped. On the steep final pitches to reach the course’s high point on Tahoe Rim Trail, I got clear of my companions, spinning my Mavic Crossmax Elite Carbon wheels over the lumpy rocks and loose sandy trail. The course trended back down toward Carson City but a lot of those final 20 miles were undulating, affording little rest. Thanks to a few spectators along the course, I gathered that Levi was ahead by a healthy five or six minutes. With the guys behind me still in sight, I just put my head down and pushed on through the last bit of singletrack. When I reached the pavement that led to the downtown finish, I was a bit surprised to find seven Carson City police officers aboard their motorcycles. Stranger still, they fired up the hogs and surrounded me on the way into town. It seemed like an odd thing to do for the guy who was in second, I thought. I rolled across the line, about four hours after the start, quite stoked on my race. I felt good. The pacing was perfect. I ate enough and had just the right amount of fluid. Then someone told me I won. It couldn’t be. Levi was minutes ahead! Did he miss a turn? Crash? Flat? I came to find out that he’d actually stopped at the last aid station. He was a little sheepish that I didn’t notice him on the side of the trail, that I didn’t have the chance to savor the win and put my arms up at the line. It was all the same to me after winning my first mountain bike race in probably 14 years. At first, it seemed like the best way to celebrate was with an infamous “Awful Awful” burger at the Nugget and some gambling. But the wait for a table was too long, and they didn’t have roulette — the only game I know. So, I decided to get familiar with the new Carson City. I checked out Union, a local brewpub that has a burger you’d never think to call “awful.” (Also one of the best coffee spots in town.) And then I stuck around to catch the music at the Four Peaks Brewing Co. Concert series. The headliner was MarchFourth, which was a little bit of a departure from the last few shows at the Epic Rides Series. This huge ensemble plays a funky blend of music that’s inspired by the marching band tradition. And they’re more than music with acrobatic performers that make pedaling a bike 52 miles seem like a trip to the store for a jug of milk. Thanks to Nevada’s lenient alcohol laws, people strolled the streets as the night cooled off with beers in hand. Or, they climbed the narrow spiral staircase to the top of a bus-turned-pirate ship that survived a trip to Burning Man to watch the show. Sure, in Nevada, you still feel a bit out of place among the retirees that while away their days in front of slot machines. But in Carson City, change is in the air.